Show me your marketing stack and I’ll tell you whether you’re a smart marketer or not. Yes, it’s that simple. No tests, no questions, no vetting your past experience. Just show me the tools you use, and I’ll tell you whether you are a smart digital marketer or not. 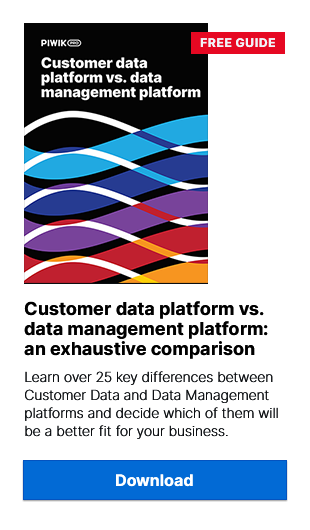 …whether you or not your marketing stack includes a data management platform (DMP). 60 percent of “high-maturity marketers” use a marketing stack that features a DMP. Having a DMP as an integral part of your marketing stack is vitally important, because it brings real, concrete benefits to those who use it. Obviously Salesforce agrees – the cloud software giant recently spent $750 million to acquire Krux, an up-and-coming data management platform vendor. Here are four advantages that you should know about – and after reading this post, you will see why making a DMP a central part of your marketing stack really is the smart thing to do. Digital marketing stacks wouldn’t exist without the data that marketers collect to drive their campaigns. At some point that data is collected, then it is usually stored in some form or another – and, ideally, it is then used to great benefit. That’s the high-level overview of the data journey in digital marketing. But the path from collection to usage isn’t a straight line from point A to point B. (More on that later…) And there may be many points of data collection – both online and offline – and several options for using the data as well. Think of it as a crisscrossing maze of paths, some of them connected, some not, and most of them not really ending up at the desired destination. Data about an in-store customer purchase made with a loyalty card, a like on Facebook for the brand’s new product page, an AdWords click-through from a product search – the possibilities for data to use are almost endless. Granted, some or all of that information might make it into one of the tools in your marketing stack (CRM database, web analytics tool, etc.) but unifying it and making it useful is far more difficult. Whether working off of cookie tracking, email address information or more complex methods of profiling, a DMP can bring together all these different bits of data, segment them, and put them in a form that can make them truly useful for marketers. In other words, make sense out of the chaos. See how smart that is? Now we’ve determined that it’s no good having data to use within your marketing stack unless it’s unified. But a DMP wouldn’t be truly beneficial if it just collected data and put it all together in nice little audience segments. What makes a DMP a truly essential part of a marketing stack is that it empowers data activation. It means that once the DMP creates the audience segments, they can be automatically exported to a programmatic advertising platform – like an ad exchange – in order to buy online ad inventory. That’s the whole point of having tools for digital marketing, right? To be able to target the most valuable customers in real time with ad spend that is likely to lead to conversions. Now just as marketers face the challenge of uniting their data sources in order to make them actionable, performance marketers also have to take the data they have – from their analytics tools, their AdWords accounts or other keyword research tools – and use it to target the right audiences across different media-buying platforms. Doing that one at a time can be repetitive and often leads to less-than-optimal results. With a DMP, all the marketer has to do is decide where to export his or her audience segment to and the syncing happens automatically. Once a campaign is served – whether on the Google Display Network, through AppNexus or The Trade Desk, or some other platform – that is not the end of the story. The question becomes – did it work? If not, what needs to be changed? In other words – campaign optimization. A good DMP will offer in-depth analytics on the performance of the campaigns its user has activated on one or more programmatic platform. This may include simple metrics like impressions served, overall campaign cost, etc. Or it may include more in-depth insights drilled down to devices, OS or geography. Because the DMP is collecting data from other sources (as mentioned earlier) to form audience segments, it can also collect data “on itself.” In other words, the insights from the campaigns run through the DMP will then serve to enrich the already (hopefully) rich data set used to form the target audience. The results of the campaign are fed back into the DMP, the audience profiles updated based on any interactions (clicks, conversions, etc) that made with it and in a very short period of time, the DMP user – your smart marketer – can refine your audience even further. Think of it like performance marketing on steroids. If the points above weren’t enough to illustrate why having a DMP as a central part of your marketing stack is so important, then just stop and think for a minute. Think about the last time you configured a large display campaign for your company or a client. How many times did you have to click to set it up? How much data did you have to upload by hand? Think about the effectiveness of that campaign. Was it successful? Are you sure? How do you know? Would it have been more effective if your target audience was better defined? Think about how long it takes you or your team to pull data out of your web analytics tool, by segments or individuals. Think about how easy (or not) it is to take that data and use it to define the audience you want for a campaign. Think about how well your marketing stack is integrated. Which does it resemble more: a well-oiled machine that consistently allows you to produce effective marketing campaigns or a sack full of toys all thrown together? The sum and substance of all of this is simply that a DMP not only brings your marketing and advertising data together, makes it easy to activate, allows for quick and effective optimization – but it can make your marketing stack just that – a stack, a system that works instead of just a group of different tools that you happen to use. Think about it – if you’re smart, you’ll understand.